While every day we get a better sense of what the new Ford Mustang will look like, and we know that Ford NA has a trademark filing for the Mach 1 name with the US Patent and Trademark Office, we don't know how such a 'stang would appear in real life. Thankfully, the photoshop hooligans over at TopSpeed have done their damnedest to render what the 2015 Mach 1 Mustang could look like. And I do say, she's a looker. Is it just me, or is there a bit of GT-R in the rear quarter window and C-pillar? 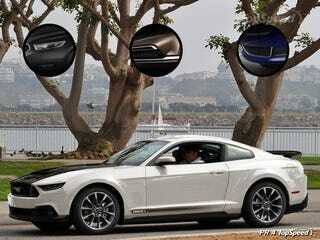 While this is just a speculative render, we already know that the next-gen mustang will largely look like this. There has been much belly-aching in the comments and forums regarding the headlights, and I ask "why?" We've done the retro 'stang, it's time to move on to a more modern style again. I know you might miss the giant round truck lights from the 2005 model. Get over it. Those look ludicrously huge now in the age of LEDs. If this is what the 2015 Mach 1 Mustang looks like, where in the model range will it fit? At the moment that is unclear, with the likeliest answer being that it will replace the Shelby GT500 as the halo of the hierarchy. It is highly doubtful that the Mach 1 will replace the GT as the volume performance model, as some have reported. The GT name is just too engrained with mainstream brand value to throw away, while the Shelby and Boss models were only known to enthusiasts and thus more dispensable/interchangeable. You can see more of renders of the Mach 1 over TopSpeed. Our Custom Misfit is Done!